Shortly afterwards her celebrity hairstylist Ken Paves explained he and Simpson had collaborated on her stunning new do by having her wear a new wig from her Jessica Simpson collection. Simpson also told the media she used powder mascara to camouflage any random blonde roots that might have popped out from the wig. In the case of Kate Winslet, it has now been confirmed. She did get her hair cut short and choppy and she went white. A lot of celebrities have been adopting the short platinum hair cuts. Ashlee Simpson, Jessica’s baby sister, who is known for being a hair color and style trend setter recently went very short and very platinum. Pita told MODERN that the platinum hue looked stunning on Kate because of her porcelain complexion but that the look can be adapted to suit anyone “as long as they are up for it”. Of course Kate’s dramatic hair makeover from dirty blonde to platinum should only be done with the help of a skilled hair colorist who can advise you of the proper shade of platinum to work with your skin and eye tone. As far as the cut, it’s always best to adjust a new hairstyle to your face shape, lifestyle and other personal preferences. If you do go short and get tired of the look? Celebrity stylist Ken Paves and his hair muse Jessica Simpson have a dizzying array of clip-in extensions, wigs and related add-on hair which can instantly take you back to your longer hair days. Note: The HairDo™ line from Ken Paves and Jessica Simpson is available in the HairBoutique.com Marketplace. For more information call the HairBoutique.com hotline at 1-866-469-4247. 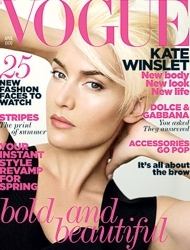 At least now we know for sure that Kate Winslet did cut her hair “short and choppy” and she did go platinum blonde. The actress was spotted this week at a New York Premiere for her HBO miniseries “Mildred Pierce.” Keeping in mind that photo shoots for magazine covers are done many months in advance it explains why Kate’s hair appears to be more baby blonde than platinum. It also explains why her hair appears longer and in some shots from New York has the look of being pulled back into a short twist. Thanks to Orlano Pita and MODERN the mystery or Kate Winslet’s cover hair has been finally solved. Note: For more information on Kate Winslet’s hair visit The Kate Winslet Gallery and Kate Winslet Hair Page. This entry was posted on Wednesday, March 23rd, 2011 at 8:05 am	and is filed under Beauty Beat, Blonde hair color, Celebrity Bites, Celebrity Gossip, Celebrity Hairstyles, Celebrity News, Celebrity News & Juice, Coverup, Fashion, Hair, Hair Accessories, Hair Color, Hair Cutting Tools, hair extensions, Hair Growth, Hair news, Hair Styling Tools, Hairstyles, Hairstyling Tips, Ken Paves Celeb Hairdresser, Long Hair, Movies & Films, Music Scene, Platinum Blonde, Ramblings On Current News & Events, Reality TV, Red hair color, Shear Genius 3, Short Hair, Short Hairstyle, Updo Hairstyle, Updo Hairstyles, Wigs, Women's Hairstyles. You can follow any responses to this entry through the RSS 2.0 feed. Both comments and pings are currently closed.